Do you use a cookie scoop when making cookies, cupcakes, etc? I got a scoop a couple years ago, and I can’t imagine going back to using a spoon. This makes it SO easy and these scoops can be used for other things, too – meatballs, melon balls, etc. 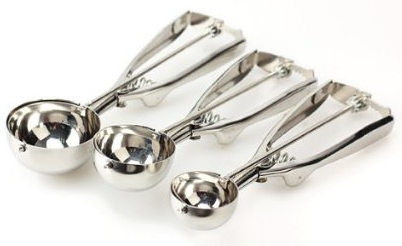 Get the 3-piece Stainless Steel Scoop Set for only $6.99 on Amazon (reg. $19). Super Saver Shipping will be FREE with an order of $35 or more or get FREE 2-day shipping with Amazon Prime.